This emerald cut sapphire is an incredibly vibrant, clear blue such that the sapphire just glows, and it's highlighted by a row of pave diamonds on either side. Shivhan picked this ring as one of her "Studio1098 Staff Picks" for the Holiday season. Shivhan loves it because "The natural blue sapphire at the centre of this engagement ring is a showstopper, with rich blue hues and subtle play of sparkle. It's an excellent choice for an interesting but classic engagement ring, or would make a wonderful right-hand ring in anyone's jewellery collection." The name sapphire comes from the Greek word “Sappheiros”, which means “precious stone” and also from the latin word “sapphirus”, meaning blue. Sapphires turn out blue when the sapphire crystal grows in the presence of titanium. There are many shades of blue sapphire. The lighter colours, often from Sri Lanka, are usual described as "cornflower" or Ceylon sapphire. The darker colours are often described as Kashmiri, as the best of these stones come from Kashmir. Montana sapphires (also a nod to origin) tend to be dark blue with a hint of green. Sapphire is the birthstone for September, and the traditional gift for celebrating 45th and 65th wedding anniversaries and birthdays. In ancient lore, sapphire was thought to be a talisman that would protect the wearer against evil spirits and creatures of the night. 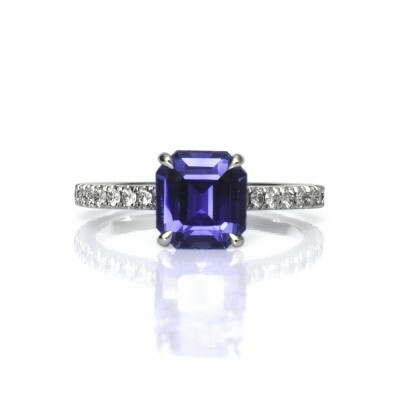 There are lots of famous sapphires, with Princess Diana (now Kate's) engagement ring being perhaps the most famous.